The first restaurant i picked for my short Hong Kong food trip this time is 8½ Otto e Mezzo BOMBANA, the award-wining Italian restaurant opened by Umberto Bombana, who is hailed “The King of White Truffles” and “Best Italian chef in Asia”. Before Bombana came the idea of 8½, he was the Executive Chef at the closed the legendary Toscana at The Ritz Carlton Hong Kong. 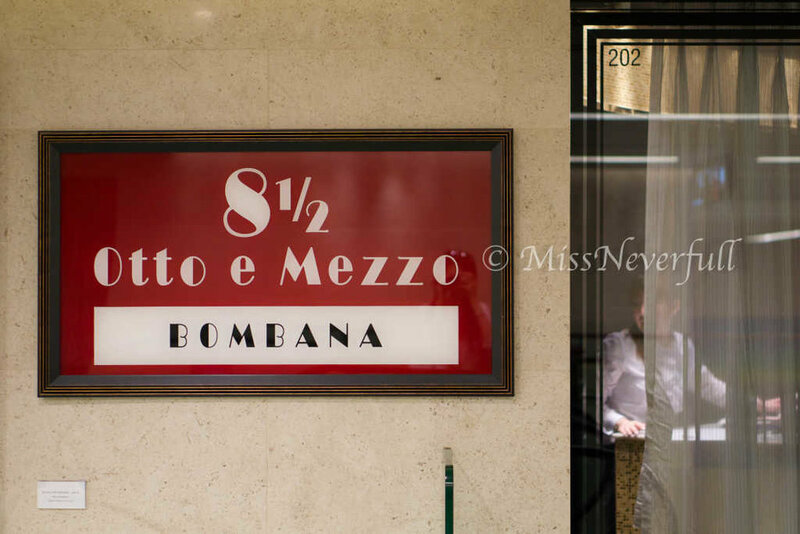 In January 2010 Bombana opened 8 ½ Otto e Mezzo BOMBANA in the Landmark Alexandra shopping mall in Central. After few months 8 ½ Otto e Mezzo BOMBANA has been awarded with Two Michelin Star, and finally the Third one arrived in December 2011: the Restaurant became the first and only Three Michelin Stars Italian restaurant outside Italy. Bombana later brought his restaurant to Shanghai and Macau. The restaurant features a elegant dining room adorned with artwork from Picasso and Dali, as well as two private rooms and a cosy lounge and a bar. Bombana combines local and Italian ingredients in a series of classic dishes. My previous visit at 8½ was two years ago, at the time i enjoyed fine dining but still on budget, thus i tried the set lunch which was not very impressive. But only one visits cannot tell all about a restaurant, i decided to revisit here, especially for its upcoming black truffle menu. Although still booked lunch (for nice pictures), this time i tried the Chef's Special Menu with wine pairing for a completed dining experience. The meal started with a freshly baked bread basket, served with some quality olive oil and vinegar. I missed their focaccia with sun-dried tomato but it was not available that day, but the sourdough with a crusty skin and fluffy inside was another great one. The breadstick was light and crunchy. The first appetizer was seared fatty tuna with caviar, which was beautifully decorated with mixed greens. The fatty tuna was seared medium, underneath the lightly seared outerlayer, the texture was melt-in-mouth tenderness. The rich oils wonderfully works with the caviar, indulgent and luxurious, the complexity of texture and flavor was really enjoyable. The citrus and tomato emulsion was quite refreshing and balanced well. The hot antipasti was deep-friend scampi with the seasonal produce, white asparagus. 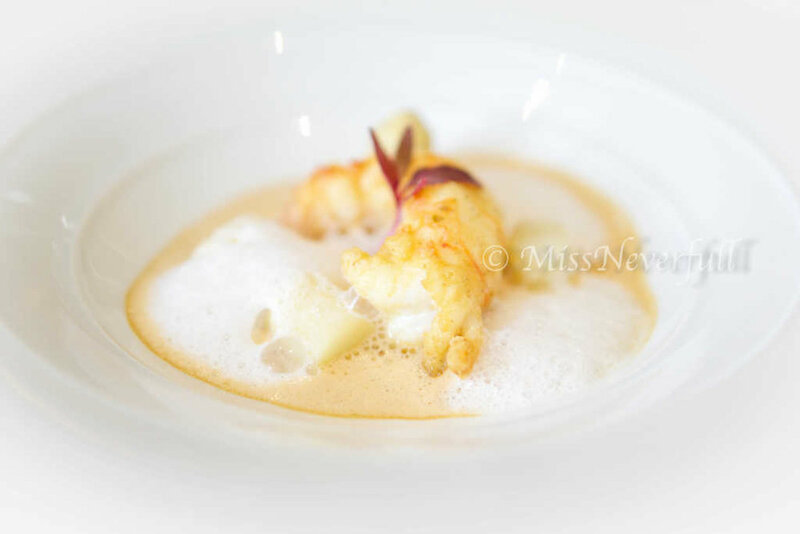 The scampi has a crusty skin and pretty tender center, the warm scampi jus base was very umami and lifted the flavor of the entire dish. While the asparagus foam as well as the light-seared asparagus nicely brought a clean and seasonal taste. 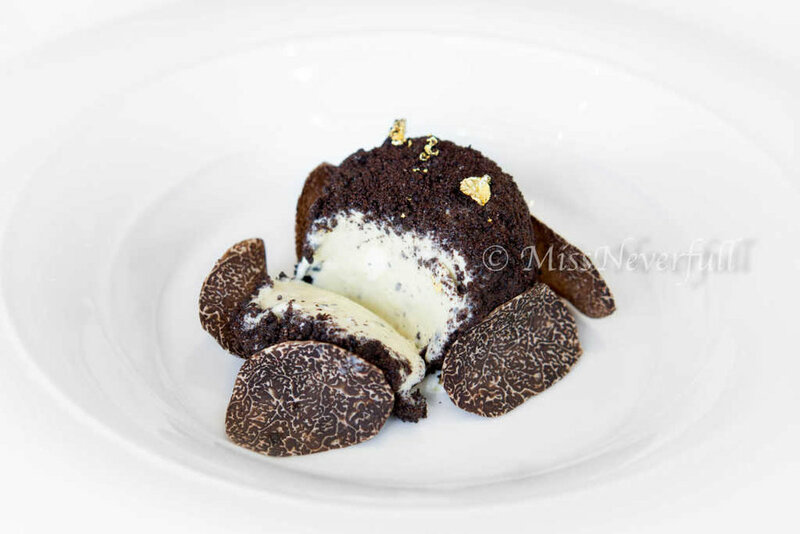 The ever-popular black truffle dish at 8½ Otto e Mezzo BOMBANA is no doubt the homemade tagliolini. The tagliolini was freshly made in-house daily, the pasta chef starts working in the kitchen very early in the morning for the highest-quality pasta in town. It was cooked al dante, no doubt one of the best in town. The tagliolini was cooked with butter and black truffle sauce, of which the fragrance even makes people who doesn't love carb dishes like me keeps eating. 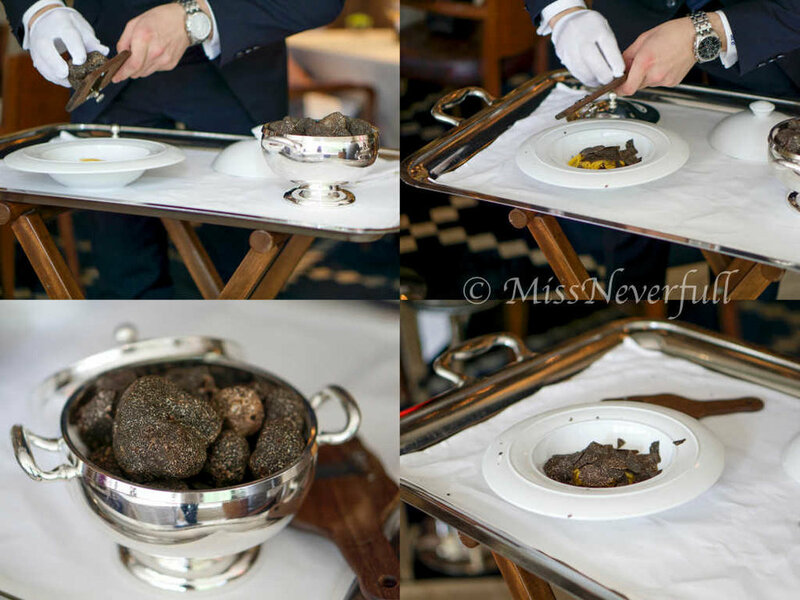 The aroma fresh black truffle perfectly enhance the sensation to the dish from all the aspects. It is really hard to find more words for describe this dish, it was just amazingly good - please try it by yourself. I picked sea bass for the main, the presentation shows its refreshness. The fish was nicely seared, the light-golden outlayer was a bit crusty, however the center part was a bit tough for my liking. But the clean taste of the fish paired very well with the umami clam jus. I was served the pre-dessert, the homemade ricotta gelato with fresh wild strawberries before entering the dessert part. Made with in-house made fresh ricotta cheese, the ricotta gelato was high in flavor, rich and smooth. The wild strawberries were very mini in size which looks like dried, but, yes they are fresh - sour and sweet. The entire combination was very refreshing. One of the most enjoyable gelato so far. The main dessert was another gelato, but a more impressive and more special one. It was my first time having ricotta gelato, as well as truffle gelato. The presentation of the gelato looks like a mousse cake, the luxurious presentation and the special aroma of black truffle wouldn't lie how delicious it is. The truffle gelato was agin smooth and creamy, the truffle flavor balanced well with the pistachio flavor, the entire dessert was enhanced by the fresh shaved truffles on the side. It was indeed the most impressive and most special dessert ever. The meal ended with a cup of warm tea or coffee and some quality petit fours. A good restaurant won't miss out any details of the meal, even the breads and petit fours. It was a really lovely meal at 8 1/2 Otto e Mezzo BOMBANA, amazing food and efficient service. The decor was pretty elegant, not luxourious nor with stunning view as Caprice, Petrus, SPOON,etc, but the quality and perfect service makes me forget about all the other factors. The only disappointing thing about having lunch at 8 1/2 Otto e Mezzo BOMBANA is the ambiance, most of the diners came for business lunch thus talks quite loud in general, but i'm sure dinner is much fine. All the dishes i had were excellent, especially the black truffle tagliolini, which is die-for. The price is rather affordable, really qualified for its michelin stars.